Kindled by a university project in 1964 which required the submission of a thesis on ‘The Gate Lodge and Estate Entrance Gates of Northern Ireland’ an interest was aroused that resulted in the publication in 1994 of The Gate Lodges of Ulsterwhich assembled those in the nine counties of that province in the form of a gazetteer. In 2016 The gate lodges of Leinsterwas published to much acclaim, followed in 2018 by the third volume on Munster. 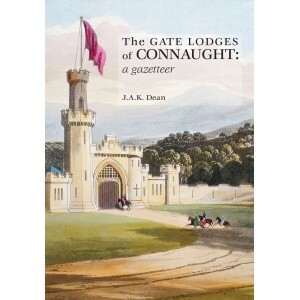 This final volume, The gate lodges of Connaught completes the set. This province-by-province study represents some fifty years of research, recording sad losses, but also celebrating the survivors. These books seek to increase awareness of the importance of the gate lodge as part of our architectural heritage by emphasising its uniqueness which in print to date mysteriously has received minimal notice in contrast with the exposure given its big house, and to balance that disparity. So often built to impress, gate lodges and entrances were intended as a favourable first encounter and, sadly, some now survive, often stranded and even more curious, as the only evidence that a great house ever existed, as with the examples at Rockingham, Bellevue and Mote Park, all outliving their houses, their survival an indicator of the architectural significance and a measure of all that was lost in a benighted age. Whilst these conspicuous examples do not set the Irish gate lodge apart from its counterpart in mainland Great Britain, what makes it unique to this island is its numbers, proliferating as it does here far in excess of those anywhere else on the planet.